Aranayake turned lush green when local schoolchildren, principals, district office-bearers and Bhikkhus alike turned up to plant 1,500 trees in the area to combat soil erosion. The trees selected were hand-picked by Janashakthi Insurance, which presented trees endemic to the area, and would provide high returns in terms of economic value. Some of the variants planted included arecanut, kumbuk, nandun and halmilla trees. 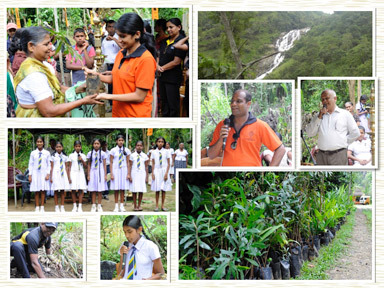 The tree-planting was held as part of a larger commitment by Janashakthi to improve the Maha Oya river catchment area. In April, Janashakthi partnered with Lanka Jalani - the Sri Lanka Water Partnership (SLWP), choosing them as program advisors to implement a unique water quality assessment project, conducted by the University of Colombo. Members of the Janashakthi team were also involved in the project. "This is the first time I am participating, and it's a unique experience to get directly involved in helping the community of Aranayake to live more sustainably," said Senior Assistant Manager, Marketing Activations, Kalum Weerasinghe as he planted young saplings alongside 20 schoolchildren and the rest of the community.